Midway through the season schedule the Louisville Cardinals are still looking for answers. With just four returning starters on defense they were the unit that was expected to struggle while installing the new 3-4 scheme but it has been the offense that has been disappointing. The Cards have started 2 rookie QB’s due to injury, So Will Gardner & true freshman Reggie Bonnafon. Both have struggled settling into the position. To add to their struggles the OL has played poorly while the WR’s have struggled in running the correct routs or plays. Bonnafon was informed of his starting against Wake Forest just two days after returning to practice after attending his fathers funeral. The one area that Charlie Strong failed to do well in while at Louisville was in recruiting OL. The Cards are starting a former walk on at center. They have consistently failed to protect the quarterback and have stalled numerous drives with penalties. The WR’s have struggled with their routes and with dropped passes. Teddy Bridgwater was able to mask these failures but asking a rookie QB to has proven to be to much. These problems can be fixed with practice and recruiting. Despite the struggles the Cards are 5-1 (2-1 ACC) and 1 muffed punt away from being undefeated. The Cards QB issues shouldn’t be a problem next year as both Gardner & Bonnafon will have more experience and they will have more competition for the starting job. Penn State transfer Tyler Ferguson will have 2 years of eligibility remaining and should challenge for this spot. Also the Cards picked up a commitment from a Rivals 4 star #11 QB prospect Lamar Jackson out of Boynton, Fla. for the 2015 class. They also picked up a commitment from QB Keaton Torre, ranked #64 overall by ESPN in the 2016 class out of Edmond, Okl. Rivals ranks him as their #7 QB. The bright spot on the season has been the defense. The DB’s came into this season with the most questions but they have proven to be strong. The Cards defense leads the nation in interceptions and Jr FS Gerod Holliman 7 Ints leads the FBS. DB coach Terrell Buckley has had an immediate impact here. JUCO James Sample has proven to be a strong addition to this defense that lost both starting safeties in Hakeem Smith and Calvin Pryor to the NFL. New DC Todd Grantham has made this defense transition swift and has this unit ranked among the best in the country. The defense currently hasn’t given up a touchdown in 13 quarters. How good is this defense? We are about to find out as the Cards head to Death Valley to face Clemson this weekend. The Cards schedule strengthenes significantly in the second half as they will travel to Clemson 10-11, BC 11-8 & to Notre Dame on 11-22. The Cards will host NC State 10-15, FSU 10-30 & rival Kentucky on 11-29. Even NC State, BC and Kentucky are looking like tough matchups. NC State gave #1 FSU a scare, BC beat USC & UK just beat South Carolina. The Cards will need to fix their offensive troubles to survive the second half of their schedule. The good news here for Louisville is that Devante Parker has been cleared to return to practice this week & could see action as soon as this weekend. Parker is a top WR prospect in this upcoming NFL Draft. 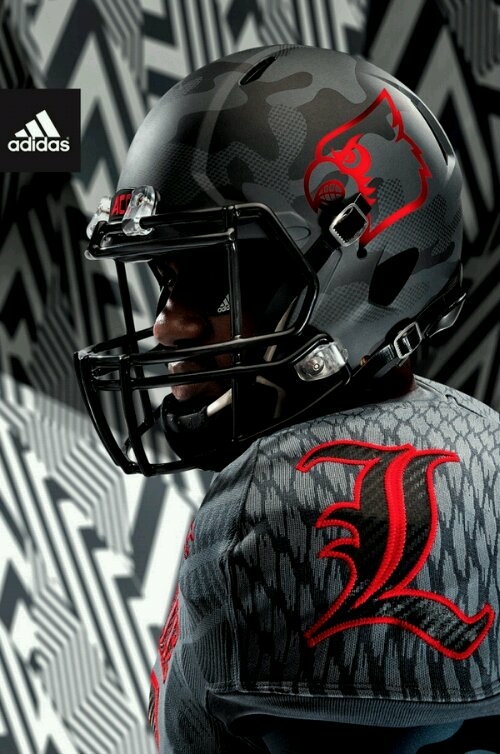 On a side note, the Cards unveiled their new uniforms for the FSU game. With their new Adidas contract comes new uniform designs. It is said that they look better in person than in this picture. I personally prefer schools to remain with their own colors but if the players like them then so be it. At least they aren’t as bad as Syracuse uniforms! Sorry, couldn’t resist it.